Posted by Maggy Parries on Aug 24th, 2016 and filed under Allgemein, Breaking News, Featured, Markets. You can follow any responses to this entry through the RSS 2.0. Both comments and pings are currently closed. photo caption: Shortlisted in the Retail Project Award, Abdali Mall project in Jordan designed and developed by Laceco and United Real Estate Company. A cast of 37 stellar names are in the running for the prestigious 2016 Cityscape Awards for Emerging Markets which recognises outstanding concepts in real estate development and architecture from around the world. Judges from 16 organisations, including chartered surveyors, academics, top architects and sustainability experts, have shortlisted nominees who will now go forward to compete for honours at the award ceremony on Tuesday 6 September 2016 at Conrad Hotel, Dubai. Once again underlining the global scope of the Cityscape Global event, which takes place from 6-8 September at the Dubai World Trade Centre, the awards will feature property developments from 16 countries. With eleven projects shortlisted in eight categories, the UAE is leading the charge, followed closely by Chinese representation with nine projects shortlisted in six different categories. 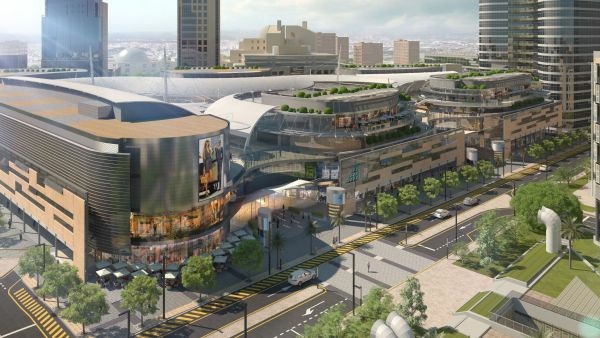 Taking part in the Awards for the first time, Laceco, along with Kuwait-based developer United Real Estate Company, is one of the international finalists to be shortlisted in the Built Retail Project Award for its Abdali Mall project in Jordan. Ahmad Kasem, Deputy CEO of URC, said: “Being shortlisted for this award is a huge honour and we are thrilled that our development in Jordan is featured among the best international projects as part of the Cityscape Global Awards. One of the judges, Christopher Seymour, Regional Development Director & Head of Markets MESA at Mott MacDonald, said that choosing this years’ finalists was extremely hard due to the impressive quality of entries submitted across all 13 categories. “I am seriously looking forward to the intense discussions that the judging panel will have over the shortlisted entries in this year’s awards since there are no clear winners in many of the categories at the present time,” he said. With environmental sustainability seen as a baseline standard, building innovation and functionality have been underlining key trends in the submitted projects. Serving as a prestigious platform to showcase future visions of urban communities, the Awards feature 13 categories across the following sectors: Commercial, Leisure & Hospitality, Community, Culture & Tourism, Residential, Retail, and Sustainability. Praising the outstanding design of this year’s projects, George Katodrytis, Associate Professor of Architecture at American University of Sharjah and member of the judging panel, said most of the finalists focused on functional and visual performance of buildings that enhance the culture of architecture and the city. “The quality of projects again this year was very high. Compared with a number of years ago, current and emerging design patterns differ substantially from those prior to the financial crisis,” said Katodrytis. The Cityscape Awards for Emerging Markets will take place during an extravagant gala dinner at Conrad Hotel Dubai on Tuesday 6 September. Another judge, Holley Chant, Executive Director at KEO International Consultants, said that entries with top marks demonstrated a clearly outlined approach to Facilities Management, which is a critical driver of sustainable operations and for maintaining healthy environments for occupants. “In terms of trends or themes, I found that entries were predominantly unique,” she said. Now in its 15th edition, Cityscape Global 2016 is expected to host300 international and regional exhibitors from 30 countries covering 41,000sqm of exhibition space. The Cityscape Awards for Emerging Markets are sponsored by Mansion Global and Crystal Gallery, Official Crystal Trophy Supplier, while the exhibition is supported by the Dubai Land Department and Foundation Partners: Emaar, Dubai Properties and Nakheel; Platinum Sponsors: Al Marjan Islands and Union Properties; Silver Sponsor: Aykon City, Registration Trustee Partner: Tamleek, Project Marketing Sponsor: AquaProperties, and Research Partner YouGov.